the reason for the instruction change might be cause.. well, the first one is odd.. it would make sense if the figure was designed to have the arm off when in the package, probably for cost/space saving, but appears unused as it came with the arm already attached. So telling the kid to attach the arm, was a bit dumb. Also, they seam kinda prototype like.. the second one points out how atleast one of the arms could do a punch, how the heads twisted and how to use both arms together to ‘hug’ others.. which is a featured used as punching himself in the face in the advert (yeah, mark of a true plotter that ^_^). where as the fact that both arms are springed isn’t said about at all in the first list.. making me wonder if the ‘hug’ idea was a bit later.. but the call out on the front kinda nixes that idea. Two Bad was one of those figures my sister got (probably just to annoy me) that i ended up borrowing. 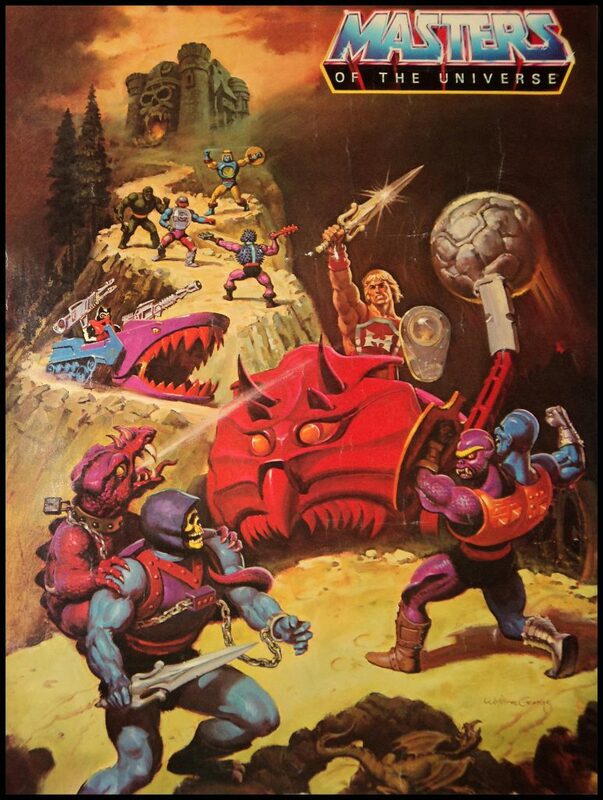 Shame they never went with the Good/Bad idea as that had a lot of potential. 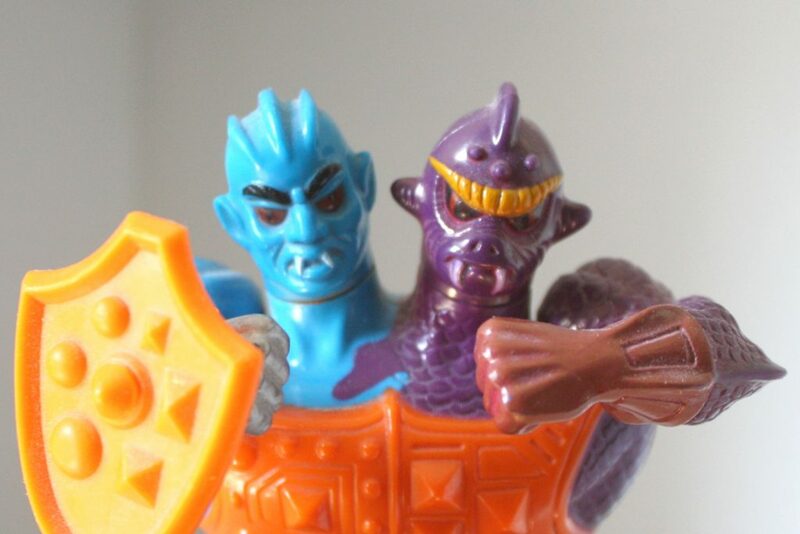 Perhaps Super 7 will take a stab at doing the double-headed good/evil conceptual character. I love these features on these characters. I can’t wait until we see Spikor. 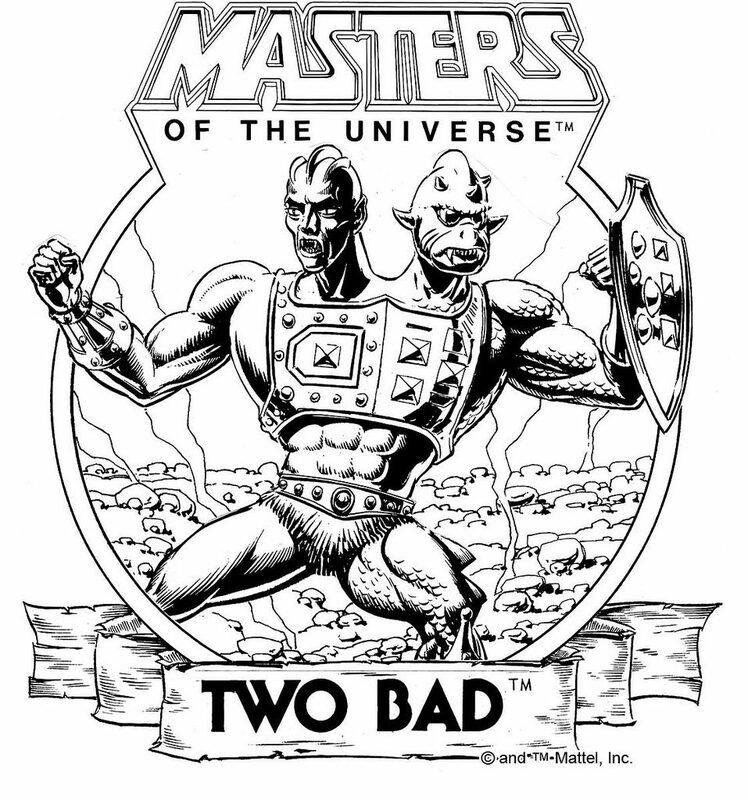 Two Bad was given a unique characterization in the UK Comics, in which he was Skeletor’s lead inventor and had his own workshop in a cave near Snake Mountain, where he was constantly coming up with new inventions to aid Skeletor. His inventions were quite amusing, they were rather ramshackle and steampunk in appearance while being highly effective all the same. 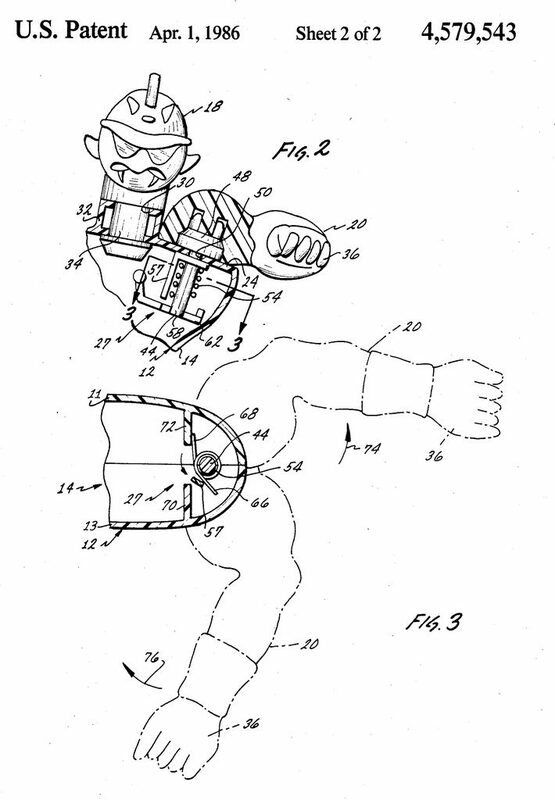 Usually his inventions would eventually backfire in a comical manner. 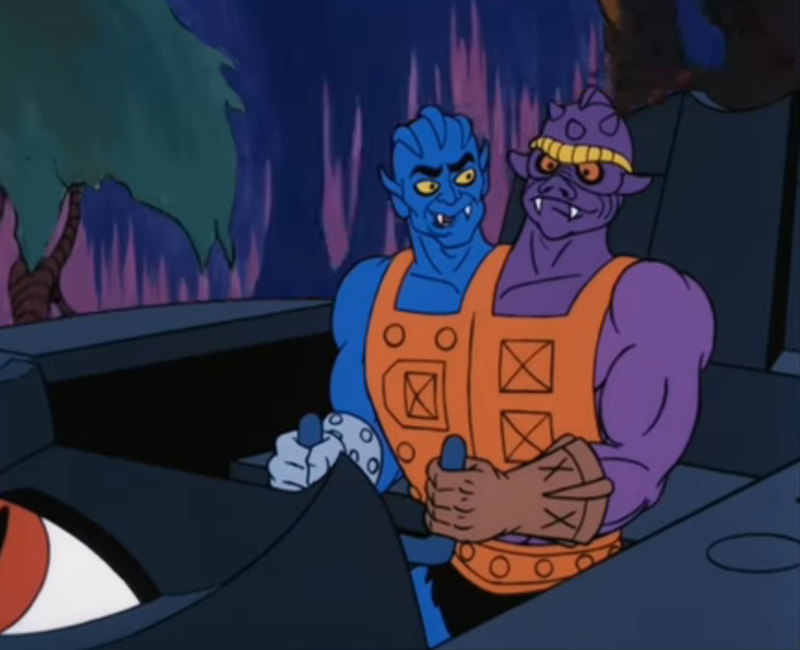 The UK Comics came the closest to using the ‘twice the plotting power’ idea in that although the heads were always bickering, when they worked together it did seem like they had genuine brain power between them. 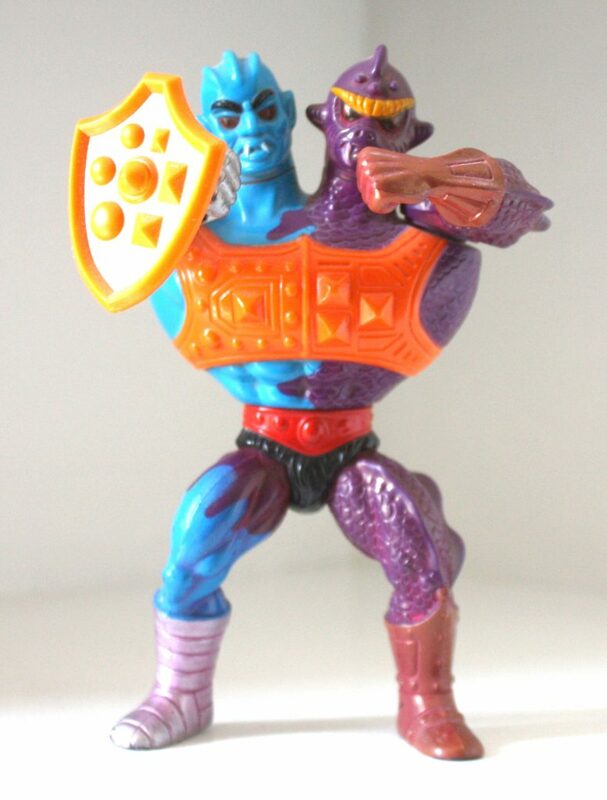 Due to this Skeletor did not fully trust Two Bad, and indeed Two Bad plotted to eventually overthrow Skeletor – between them the heads intended that when they helped him defeat He-Man, they would create a weapon that would destroy Skeletor himself so that Two Bad could rule Eternia. 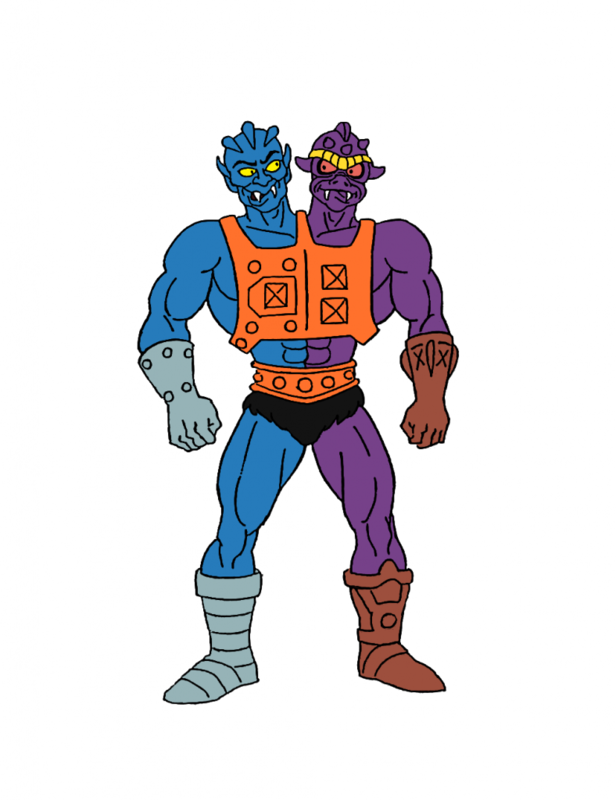 The heads had individual names in the UK Comics – Blue Head and Yellow Band, which apparently came from Filmation’s notes for the cartoon although they were never used in the cartoon. 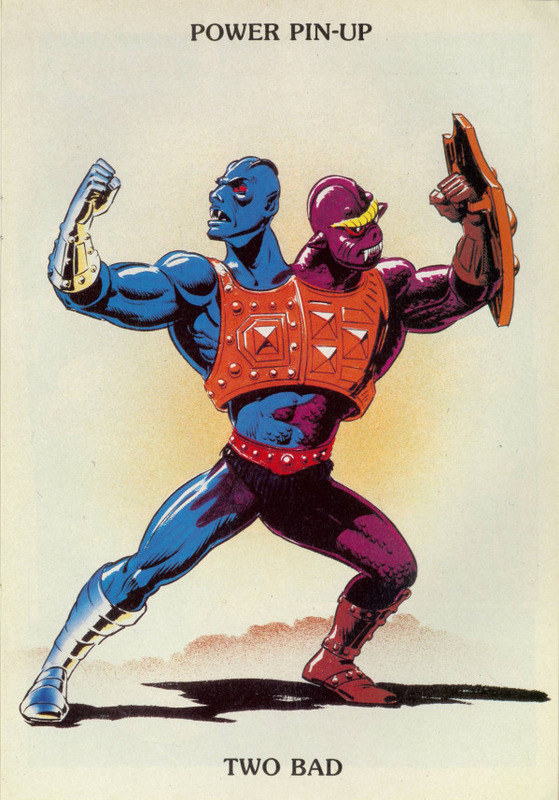 For me personally, the UK Comics gave the strongest portrayal of Two Bad to this day. 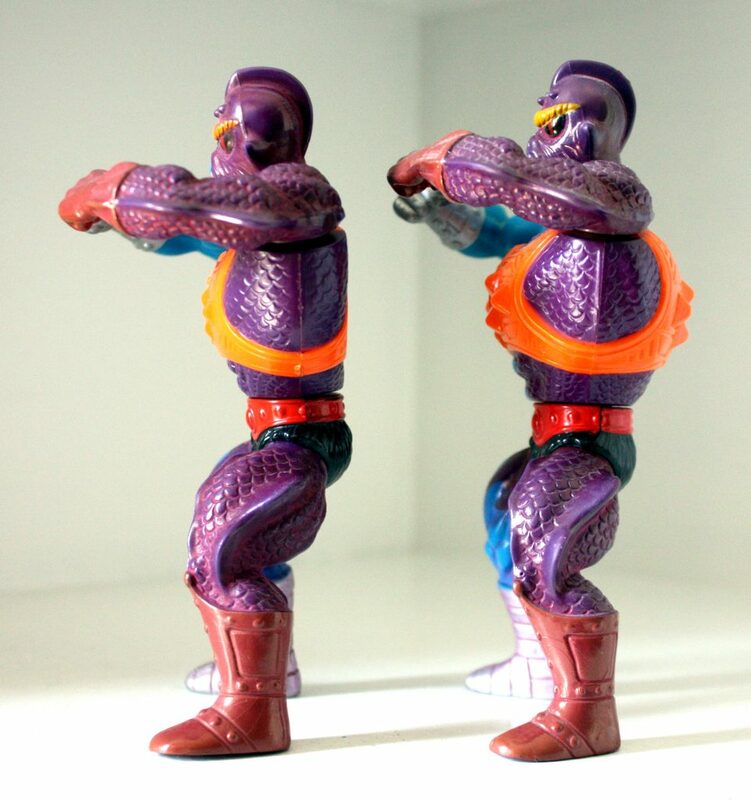 Great to see another vintage character/figure review, Battleram. 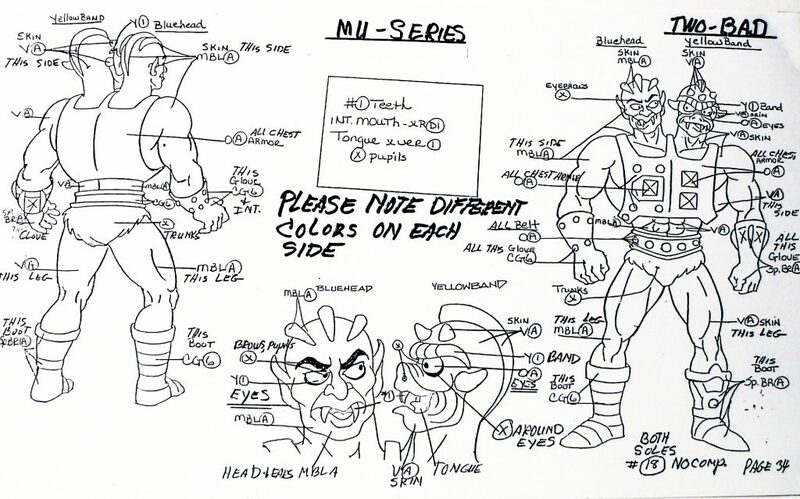 As much as I enjoy the blog’s other content too, it is these detailed development rundowns that I love the most. 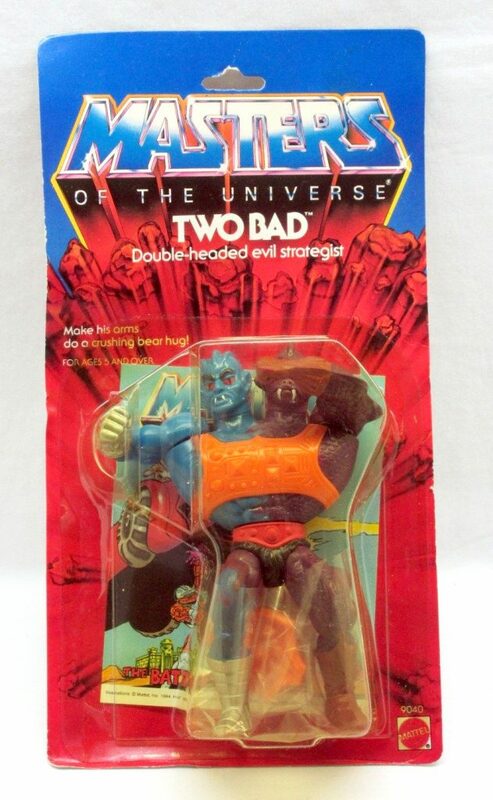 Although not one of my least-favourite characters, Two Bad was a figure I didn’t have as a boy. I just found him a bit too clunky and awkward looking in his design, and maybe represented how the line was becoming a bit more “gimmicky” as the waves progressed; not enough incentive to save my pocket money for him. 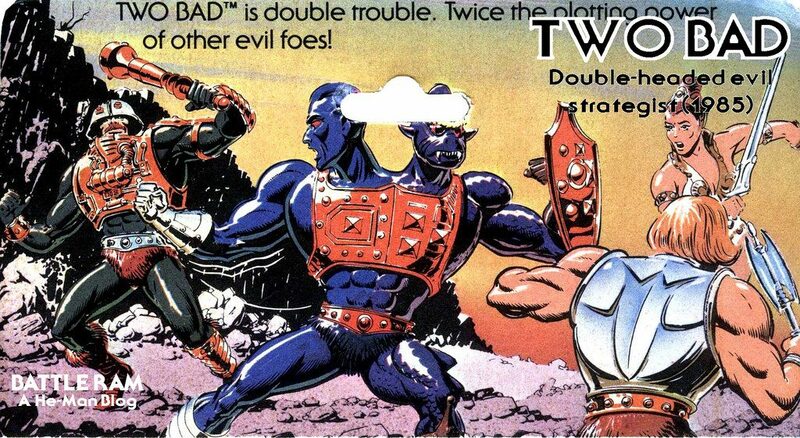 I’ve known from his early idea as “Half good, half bad”; I’d imagine he fell under the same strict “We need them to be either Heroic or Evil” policy that saw so much confusion and backtracking on Zodac’s status. 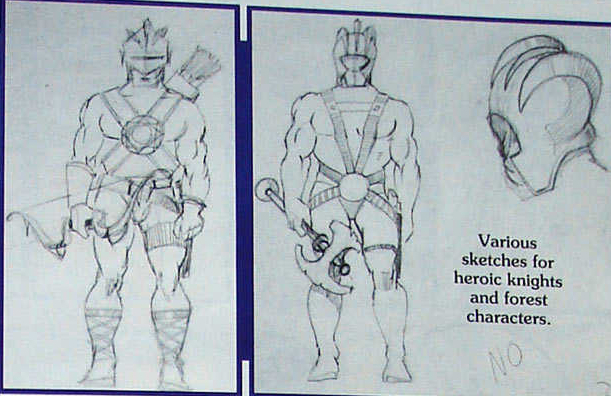 I wonder if I’d have taken to the character more if he had been constructed better – the torso is very bulky and clunky (even on the second, flat-back version) and the arms make it look even more awkward. 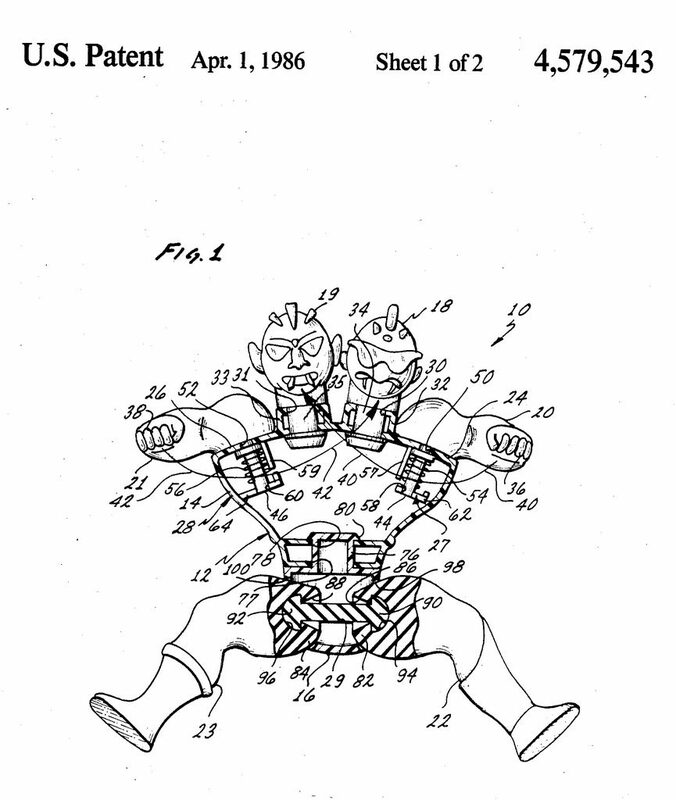 And everyone was always confused as to the “idea” of the arms – the packaging indicated they were to be used to ‘bear hug’ an opponent (which never really worked), whereas most people used them to hit the opposite arguing head in the face! I think the feature didn’t work and should have been saved for a separate figure specifically to use the bear hug feature. All crammed into Two Bad, it was just too much. 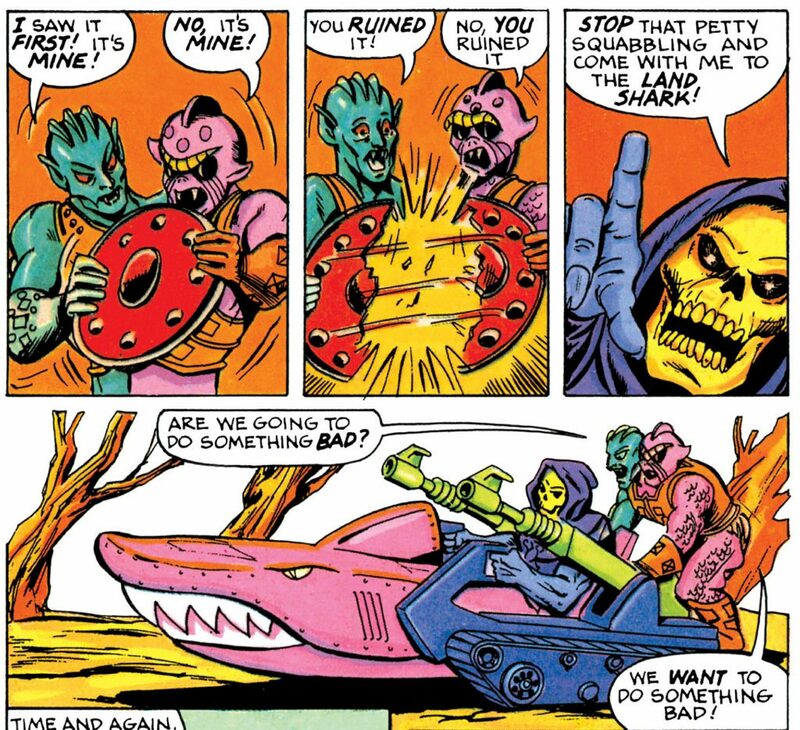 I remember the UK comics presenting TB more as Skeletor’s inventor, maybe to capitalise of his “strategist” tag which was very little played upon anywhere else. 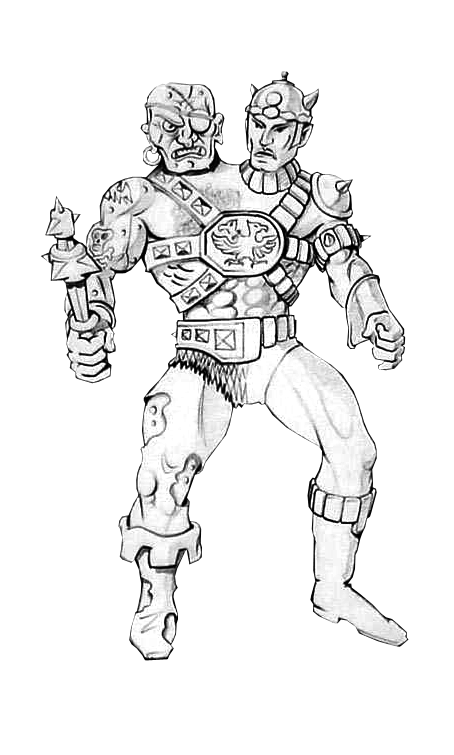 Personally when 200x made Tri-Klops Skeletor’s inventor I didn’t like it (because I love TK at the early bounty hunter version seen in second wave mini-comics and wanted to keep him as that), though personally I always had Trap Jaw down as Skeletor’s inventor in my own MOTU world. When I collected the line second hand. I did find – as mentioned in the article – that the purple sections suffered quite severe bleeding in some cases. 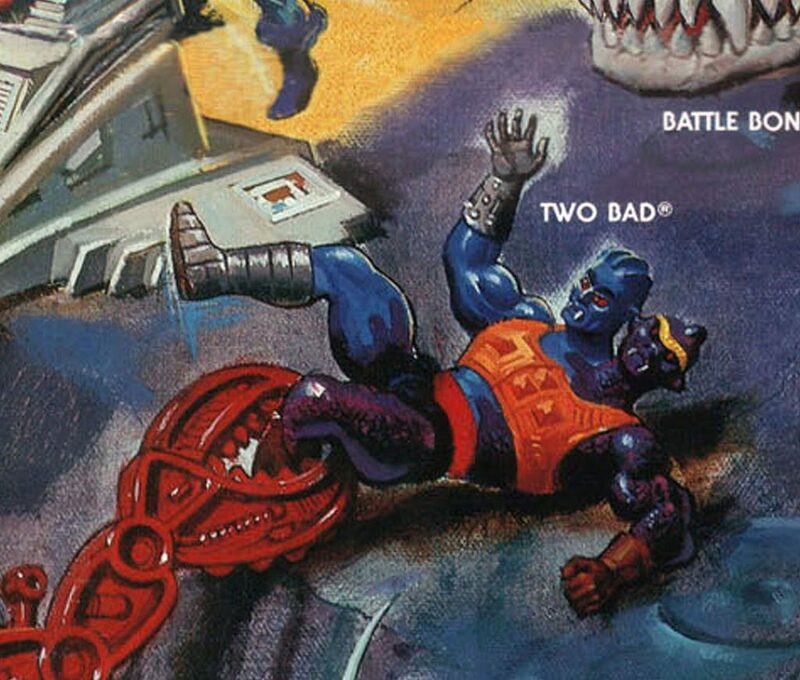 In terms of deterioration, Two Bad was generally amongst the worst of the line (along with Roboto, who’s red and silver legs have often bled so much to give them a purple tint, that some collectors assume this to be an actual variant). Thanks very much! I agree, they tried to cram too much into Two Bad, and the figure suffers for it. Honestly I don’t think he needed an action feature beyond the standard spring waist. 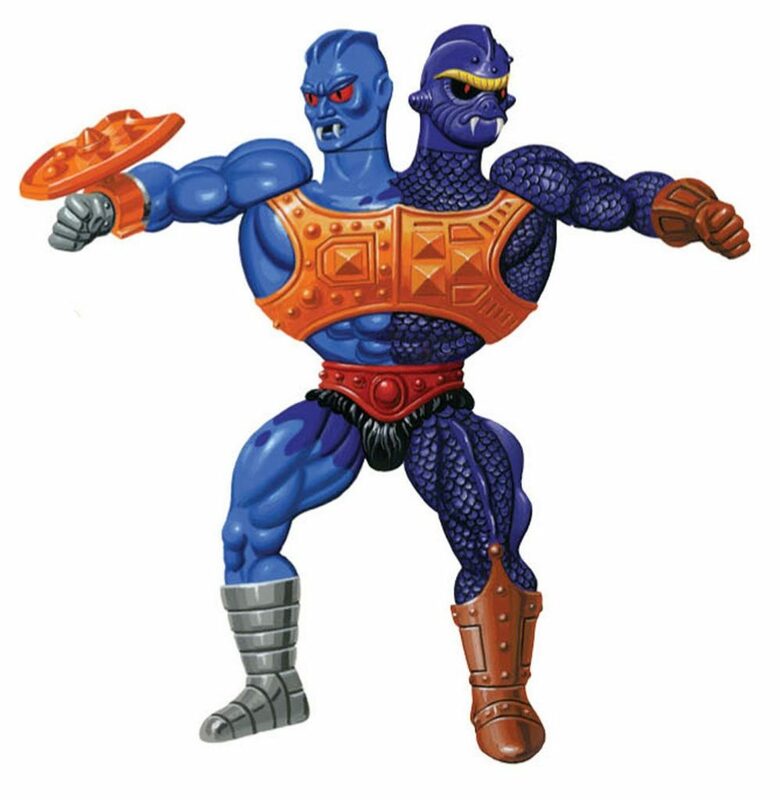 The two heads are a big enough draw on their own. The prototype version looks much better, but would look better still with the arms at the sides like all the other figures. 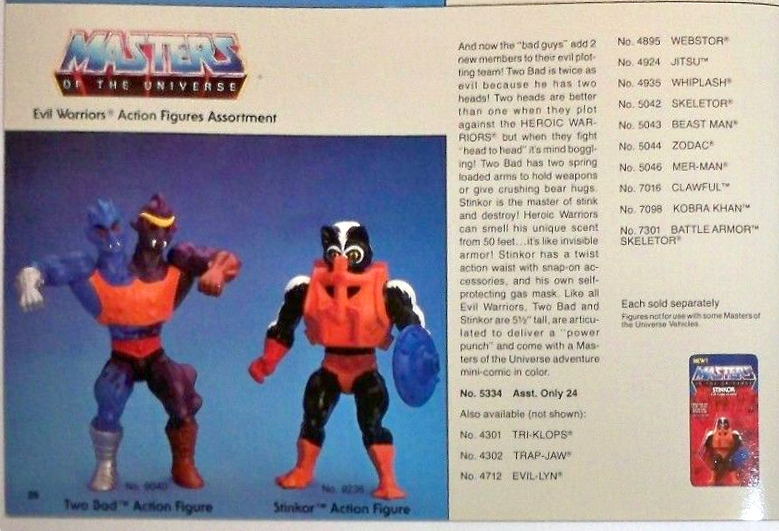 I think with each passing wave, the general mindset at Mattel was that each figure must have it’s own specific “feature” (which adds to the feeling over “over-gimmicky” as the line progressed), and whilst variety and unique play features are nice, some figures just didn’t really need much beyond the standard spring-waist. Two Bad, on hindsight, is a classic case of this. In concept, quite a cool design, yet just too much “Add more! More!” to it which just rendered the final figure not all that great looking. 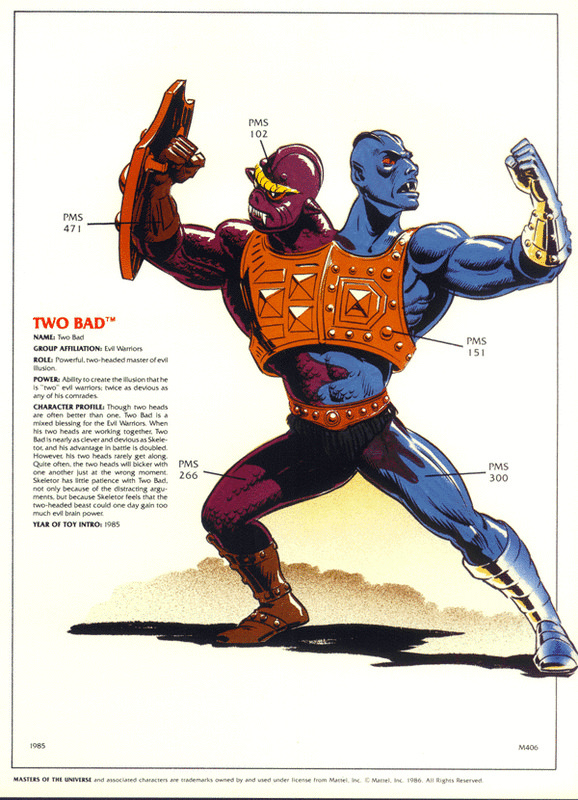 BTW I should point out that as a character I don’t hate Two Bad (although the classic first two waves and barbarian mythos are always where my heart is at), it’s just more down the clunky design of him which has never really endeared me to him. 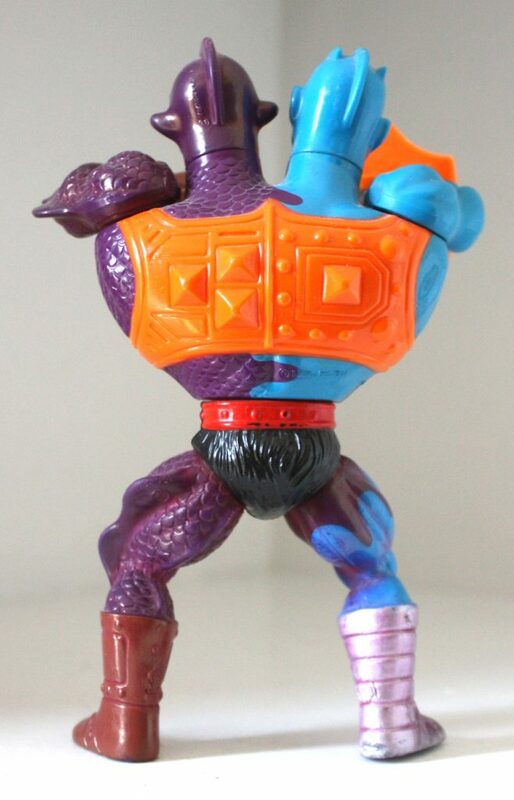 I never really took to the Tuvak and Badaar origins of the character from the 200x series; to me he’s one of those quirky characters that doesn’t really need an origin! 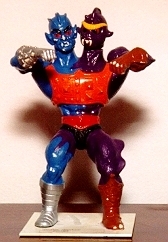 However, whilst I wasn’t overly keen on many of the 200x figure designs, Two Bad generally rated quite highly with me, as he looked FAR less clunky, and it also played up the “two different halves merged together” element far more. 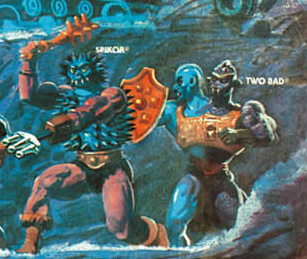 One other minor thought I’ve long had – in a couple of panels in ‘The Battle of Roboto’, Two Bad is seen arguing over a deep orange (almost red) shield. Although this may have just been thrown in at a whim to illustrate how Two Bad often argues with himself (and ends up breaking the shield! 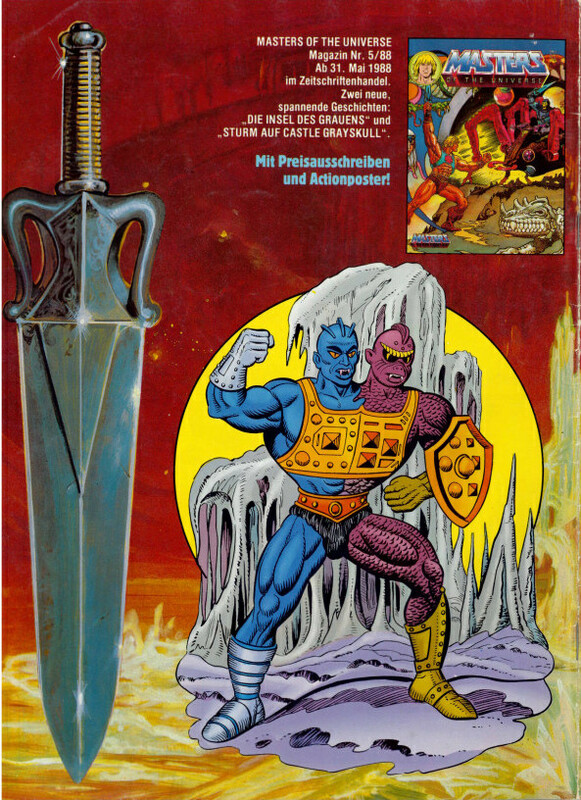 ), it’s design does resemble the Castle Grayskull shield, which in turn was recycled to be packaged with Stinkor. I wonder if at some point in the prototype stage, Two Bad was considered to come with this shield, before being given his own, uniquely designed shield? I have a great memory of Two Bad from childhood. 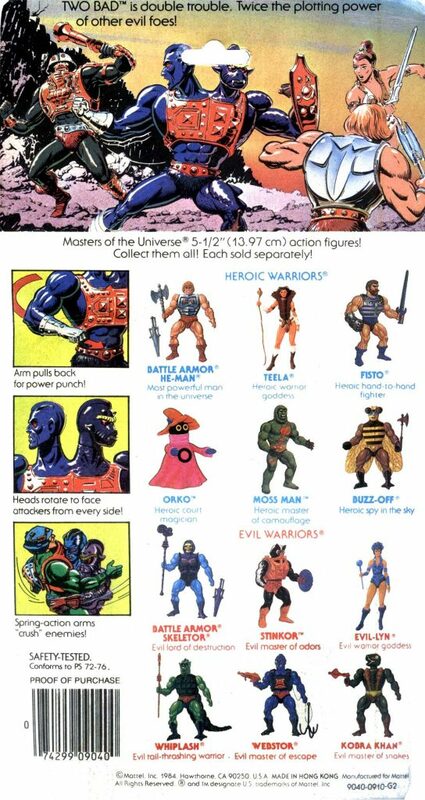 This was back in the day when you could walk into a toy store and be surprised by new characters that you’d never seen before and didn’t know were coming. I was out shopping with my mom and grandma. My grandmother loved spoiling me with toys. 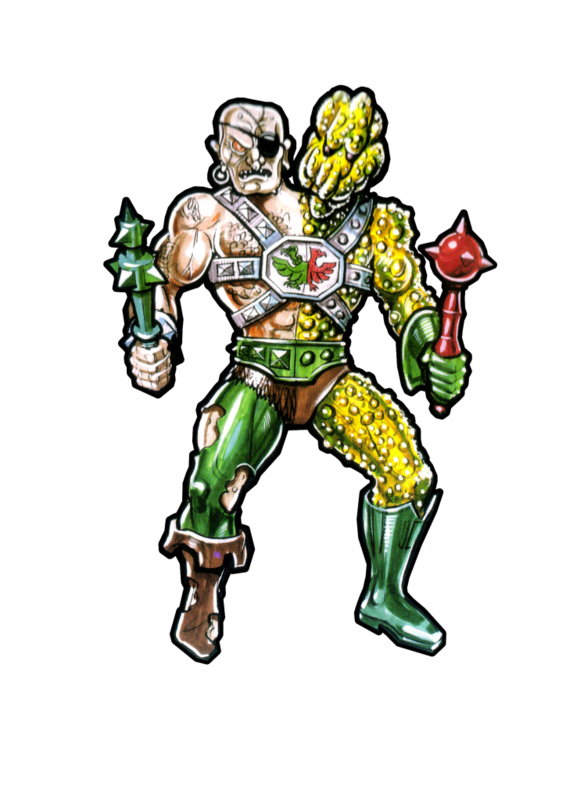 I was looking at the racks of MOTU figures, and on a shelf below the pegs was a single Two Bad figure, but the top half of his card was ripped off. 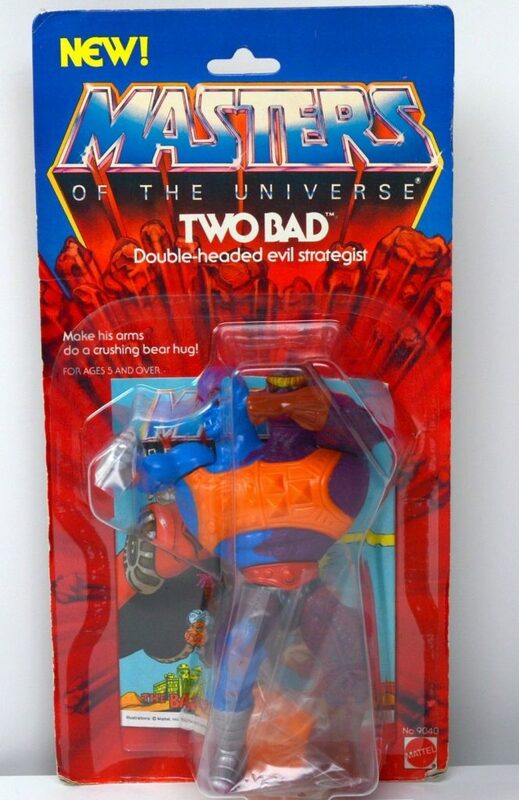 I’d never seen the figure/character before, and with the top of his card missing, I didn’t know what his name was or if he was good or evil (although I had a pretty good idea he was evil). My grandmother saw me studying the figure and asked, “Do you want me to buy that for you?” Of course I said yes, and the character remained a bit of a fascinating mystery to me until I eventually saw one again in a store with a complete card, finally revealing his elusive name to me. 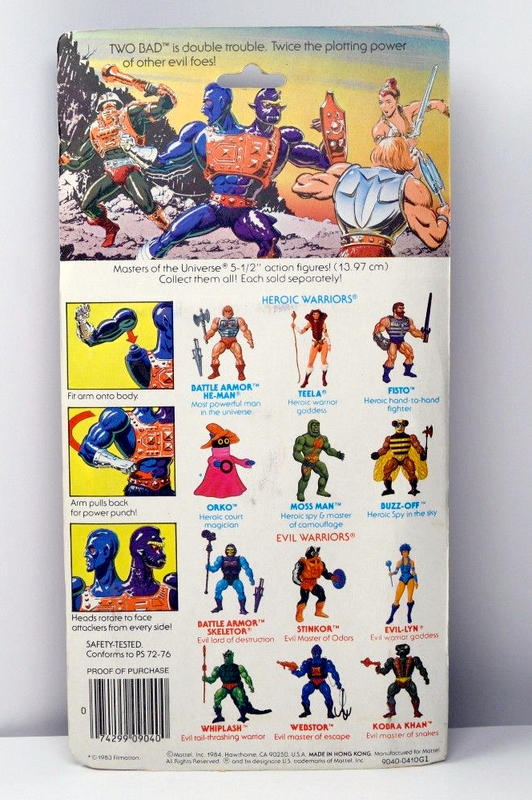 I also only used the figure’s action feature to “grab and crush” other figures until my older brother showed me he could punch himself in the face. I didn’t like that idea. 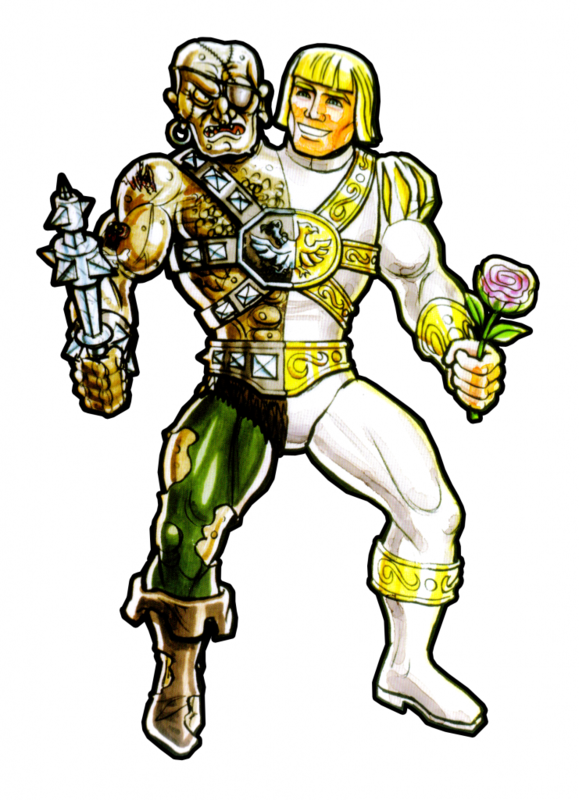 In my mind, the two sides got along well, which made the character a more intimidating villain.